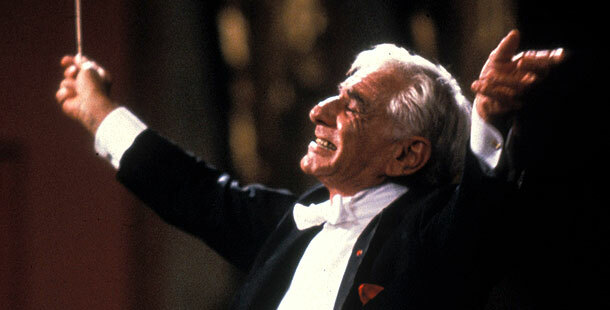 A presence on Broadway, in Hollywood, at Carnegie Hall and the New York Philharmonic, Leonard Bernstein was a major force in twentieth century music. His exuberant and dramatic style caught the heart of America, bringing classical music to thousands of people from diverse backgrounds. More than any American conductor before him, Bernstein expanded the audience of classical music while maintaining a deep artistic integrity. Bernstein was born in Lawrence, Massachusetts in 1918. His parents were first generation Jewish immigrants from Russia. Though he began learning the piano at age ten, his family hoped he would follow a more practical route, and sent him to the Boston Latin School. After graduating, he attended Harvard University, where he majored in music. His interest was in becoming a concert pianist, but upon graduating he began to seriously study orchestration at the Curtis Institute of Music in Philadelphia. More important than any of the formal training, however, were the summers he spent in Tanglewood, Massachusetts, studying with the great conductor Serge Koussevitzky. In 1942, Koussevitzky invited Bernstein to be the assistant conductor at Tanglewood. Though very young for a conductor, his flamboyant style and emotionally charged performances caught the attention of others in the classical music community—one of whom was Arthur Rodzinzki, who appointed him assistant conductor of the New York Philharmonic. It was at the New York Philharmonic that Bernstein got his big break. 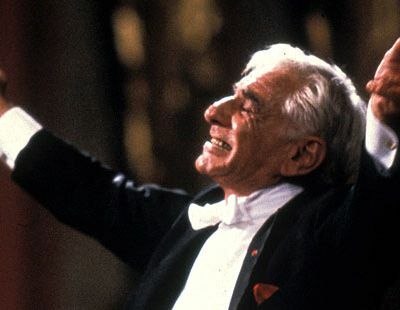 Asked to fill in for an ailing guest conductor, Bernstein (then only twenty-five) conducted a difficult and energetic performance with only an evening’s preparation. Impressing all who came, Bernstein found himself on the cover of The New York Times — an instant celebrity. Within two years he was named the director of the New York City Symphony. He spent much of the 1950s conducting, teaching, and becoming involved in composing for non-classical genres. Of his many popular efforts of the time, On the Waterfront (1954), Candide (1956), and West Side Story (1957) are the best known. For On the Waterfront he received an Academy Award, and for nearly everything he did, he received the acclaim of an adoring public. In 1957, Bernstein returned to the New York Philharmonic, where he was to make his greatest contribution to the music world. The versatile musical genius that had made him a success on Broadway and in the classical concert halls of the world, found its true home at Lincoln Center. For the next eleven seasons, Bernstein would energize the Philharmonic and American classical music in a way no other director had done. Taking advantage of the recent technological advance of television, Bernstein presented classical music to a wider audience. While he toured throughout the world, visiting seventeen different countries, he also concentrated on creating accessible performances for the average American. For both children and adults, he created shows which were both entertaining and educational. By the time of his resignation from the Philharmonic, he had conducted nine hundred and thirty nine concerts with the orchestra—an unprecedented amount. Throughout the 1970s and 1980s, Bernstein concentrated on the solitary act of composing, while maintaining a presence in the music world. He was often derided for his political involvement, which included his early stance against the Vietnam war and his support of the Black Panthers, but continued to draw crowds internationally for his entire career. On April 19, 1990 Bernstein conducted a fiftieth anniversary concert commemorating his beginnings as a conductor at Tanglewood. Three months later he died. Until the very end of his life, Leonard Bernstein maintained the verve that had invigorated the American classical music world and brought thousands of listeners closer to the music he loved so much.